Charming cottage with beautiful views of the castle, mountains and Lake Annecy. Chalet for 2-8 people, comfortable, fully equipped. 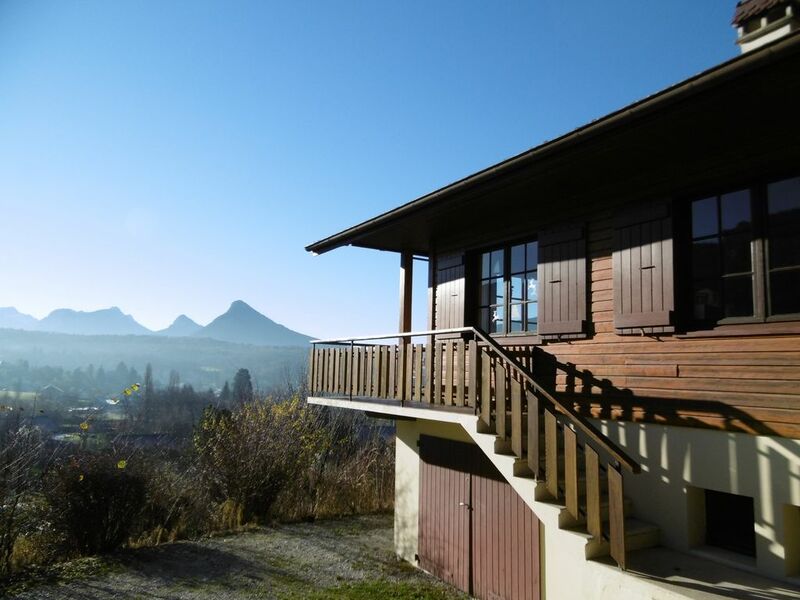 An exceptional chalet with panoramic views over the castle, lake and mountains. The place is ideal to soothe, relax and spend a nice holiday with family or friends! Open views and very sunny. At 10 minutes drive from the center of Annecy (8km), 10 minutes walk from the beach, 5 minutes walk from the village of Menthon St Bernard and all its amenities. Quiet, in a privileged environment, still close to all amenities. An attractive region share the many possible leisure activities (tourism, nautical activities around Lake Annecy, sports activities, cultural activities ...). Access to 10 minutes drive from the city center of Annecy, the old town, sometimes called the 'Venice of the Alps' and shops. All possibilities and variety of mountain activities Haute-Savoie in winter and summer. Ideally located in the heart of the Alps (Geneva 45 min drive, Chamonix and Megève 1 hour), our cottage is also close to all amenities. You will be close to the village of Menthon-Saint-Bernard, its beach and its activities. Nature, open spaces are near the cottage. Nearby you will find a range of roller and multiple sports activities: sailing, windsurfing, water skiing, wakeboarding, scuba diving, fishing, golf (10 minutes from the Talloires and 10km from that of giez), riding, summer sledging, tennis, hiking, biking, cycling (bike trail 1 km, the Aravis management or direction Annecy Lake with extension / Faverges / Ugine). For the winter season: skiing, snowboarding, cross country skiing, snowshoeing, snowmobiling and maybe rides huskies! The best ski resorts in the region, such as the Grand Bornand and La Clusaz, are only 25 km (30 minutes drive). Restaurants close to Menthon St Bernard (The unexpected, confidentiality, harbor cottage, Palace ...). If you love great regional food you will find in the surrounding establishments appearing prominently in the Michelin guide, such as The New Home of Marc Veyrat in Veyrier-du-Lac and L'Auberge du Père Bise, in the splendid Talloires bay or refined gastronomy Palace in Menthon St Bernard. You can practice paragliding from the beautiful lake view from 'the Col de la Forclaz'. In August the feast of Lake Annecy and fireworks, fireworks rename world in Talloires and even the famous shows 'sound and light' Castle Menthon St Bernard in summer. In winter we are a few kilometers from the ski resorts of La Clusaz and Le Grand Bornand. A huge lot of greenery and trees available around the chalet. Double-friendly living room and terrace with stunning views of the region (castle, mountains, lake). Cozy rooms combine comfort and personality with a touch of different decoration in each room. Decorative furnishings authenticity loan and aesthetics. Plenty of storage available in all rooms. Vehicle necessary in order to make the most of their stay in the area, access to a shuttle from the Annecy station. You can park 3 cars (maximum) within the property. Numerous free parking also in the village. (blanket and pillows included in the basic benefit). Thanks you for your return! Hope to see you again in the region of Menthon St Bernard! My mother and myself greets you! Stunning property in a stunning area! A gorgeous place to spend time, waling distance from all necessities, supermarket, bakery, café culture, and down to the bus stop which, for 1.5 euros takes you to the Centre of Annecy. Hired bikes, completed paragliding, even had a few climb the Col de Colombiere for a cyclists dream, and had fantastic days by the lake, the list of things to do is endless. The property is owned and maintained by a fantastic family and they could not do enough to help , and I would recommend this property to any one wanting a fantastic time in and around Annecy...You will not be disappointed and we will be back for sure! Thank you of your very positive comments and we are satisfied that you have appreciated your stay. I hope to see you another time! A family of five had a wonderful vacation in Menthos / Annecy. The house is well equipped for family. The beds are a bit to small. We could walk to the beach (10 min), supermarket and restaurants. The owners were very helpful. Nous avons passé un magnifique séjour avec nos trois enfants (4,7,9 ans). La maison est impécable, sécuritaire et sa localisation est idéale pour les ballades en montagne, la plage et tous les services. La vue sur les montagnes, le lac et le château est impressionnante. Alexandre et sa maman qui s'occupent de la location sont tous les deux vraiment très gentils, retournent rapidement les courriels/appels et tout se déroule exactement comme prévu. Merci de votre retour extrêmement favorable cela fait plaisir que tout se soit bien passé et que vous ayez profité de la région! J'espère vous revoir une prochaine fois et vous souhaite une bonne continuation. Excellent location with beautiful views 180 degrees. Very convenient and within walking distance to the town below, and an easy drive to Annecy and all around the lake. Inside is a little dated and needs new bedding, including mattresses and pillows -- all very lumpy. (Once these are replaced, will give 4 stars.) Nice laundry room in the basement. Lovely, very sweet owner. Thank you for your rather positive return altogether. We had still had no remark about the bedding even if we planned to change it soon.It is a pity we are had time to speak about it. Please note that since nearly 2 years the bedding are now all NEW with super quality to sleep to pass good holidays! For a next time with us wish it a bigger satisfaction from you. We spent 10 wonderful days at this chalet in Menthon. It was great to be able to walk into town for coffee/bread in the morning, walk to the lake and the views are amazing. Even with the heat wave, we stayed quite cool in the downstairs bedrooms. Thank you for a wonderful stay! Thank you for your very positive return! It is true that it made very good weather and warmth during your stay; I hope that you took advantage of the lake to cool! I also hope that you were able to find certain memories of pasts because you already knew the region. Detached chalet in a quiet and preserved near the village of Menthon St Bernard and Lake Annecy. Our cottage is located 45 minutes from Geneva, 1h00 from Chamonix and Megève and is also close to all amenities. From the cottage, walk fast access by roads or small road in the direction of the village and the lake. The village of Menthon Saint Bernard on the bank sunlight Lake Annecy has all year a particularly mild climate. Activities and shops open all year allow a pleasant stay whatever the season. The environment and location are ideal for an active holiday with family or friends. 10 min from the lake, access to the fast track, and swimming possible along the lake with free everywhere. 10 minutes of tennis, 5 minutes walk from the village of Menthon-Saint-Bernard and shops, 10 minutes drive from the city center of Annecy, the old town and its shops. - Take the A41 motorway and exit south Annecy, direction Annecy Annecy center. Then direction Lake right bank. Then you follow the lake road and cross Annecy-le Vieux and the village of Veyrier du Lac. Arrived at Menthon Saint Bernard turn left before the church towards the castle, then climb for about 400 meters cross a small bridge and turn left at the first road to the edge, then a few meters and you are already arrived! In case of difficulty, please contact us directly. In summer: Walks and rides, white water sports, canoeing, rafting, boating around the lake, tours, hiking, mountain biking, cycling, walking, paragliding (20 min) website forclaz, gliding, more sports classics for children (ping pong, volleyball, tennis, tree climbing, bowling, outdoor games, mini-golf ...). Swimming lake 10 minutes walk. Bowling, disco, billiards, games room and even casino nights can be near Annecy. We are close to the Cher Roc in the forest with hiking trails. Close to 10 m from the beautiful Bay of Talloires. Tourism and shopping in Annecy. Close to Mount Semnoz (or a few ski resorts are present). In winter, possibility of track skiing (25 min) to the Cluzaz, Le Grand Bornand, cross-country skiing in St. Jean de Sixt, ice skating, indoor swimming pool, sauna, hammam, jacuzzi to Cluzaz. Very typical mountain restaurants: Chalet Aulp (Montmin) Plan Ledge (Aravis) the Confines. Contactez de préférence le propriétaire avant toute demande de réservation (échange mail et/ou contact téléphonique). Option facultative N°1: Frais de nettoyage de fin de séjour: 80€ Option facultative N°2: Frais de linge de toilette et draps et taie d'oreiller: 80€ (couverture et oreillers compris dans la prestation de base).